Last night at the CCC, we hosted what could only be described as “Hockey Christmas”. 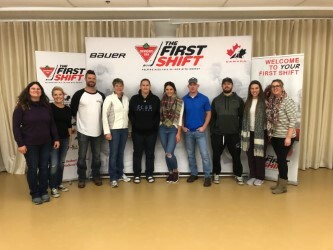 If you were anywhere near the building you would have felt the incredible buzz from our newest 45 First Shift participants and their families! These excited kids, lined up to check in, get their hockey bags, put their jerseys on and then they visited each station to collect their helmets, pads, skates, socks and sticks! The Canadian Tire First Shift program gives kids, who have never played hockey before, an opportunity to try out this fabulous sport and learn the basics while having FUN! They are each outfitted head to toe with equipment, and provided with 12 on-ice sessions with our fantastic volunteer instructors. Many thanks to our Director of Development, Andrew Cullen for coordinating this program for our future Nighthawk players,and to Jaclyn Diminie for stepping up to share her hockey expertise with this group as our Head Instructor along with a very qualified group of volunteers. And a special thanks to the First Shift staff who were full of passion and enthusiasm for the sport and simply captivated the eager kids at each of the stations. If you want to catch a glimpse of the next generation, of super cute hockey players, they begin their on-ice sessions November 3rd at the Pond.